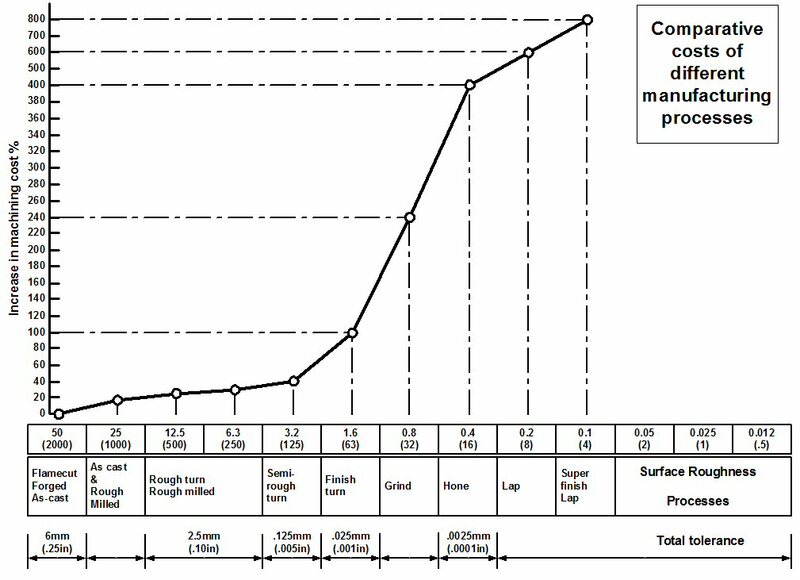 The chart below shows the surface roughness capablity of various manufacturing processes. Variations on this chart can be found almost anywhere. We think it originated in Machinery's Handbook! Surface Roughness Chart - Shows the roughness average for different manufacturing processes in micrometers and micro-inches. The values are shown with a typical range and a less frequent range for each manufacturing process. As a general rule the lower on the chart and further to the right means a more costly process. Basically the finer the finish and the tigher the tolerance the greater the cost. Ideally from a cost impact point of view it is best for the designer to accept the finish and tolerance capability of the primary process. Part performance and functioning usually dictates that this is not possible so consideration must be given to what kind of secondary processes will be required to enable the component to perform as desired. The charts below show the relationship between Tolerance and Surface Roughness. Relevant books are listed below. Click on the cover image and you will be taken to the Amazon bookstore. ISBN: 1-4020-1653-0 Shows that process planning, now fully integrated in the manufacturing system, can be regarded as a science by using a logical approach. Three aspects of process planning are covered: the integration of process planning and design; process planning itself; and the integration of process planning and production management. ISBN: 083112900X Where would we be without Machinerys!